Spring is still a long way off but it’s times like these that I draw on past experiences so I can continue to be thrilled by insect natural history even during the coldest of months. 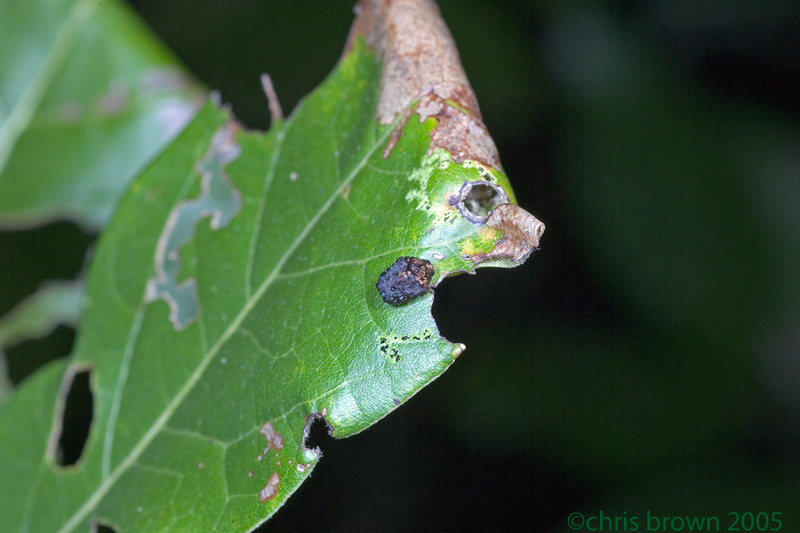 In this case I am thinking back seven years ago to my first encounter with a warty leaf beetle. These beetles are certainly unremarkable for their size or coloration but the “set-up” shot below attempts to illustrate what is amazing about warty leaf beetles. Can you pick out the single individual warty leaf beetle (Exema sp.) 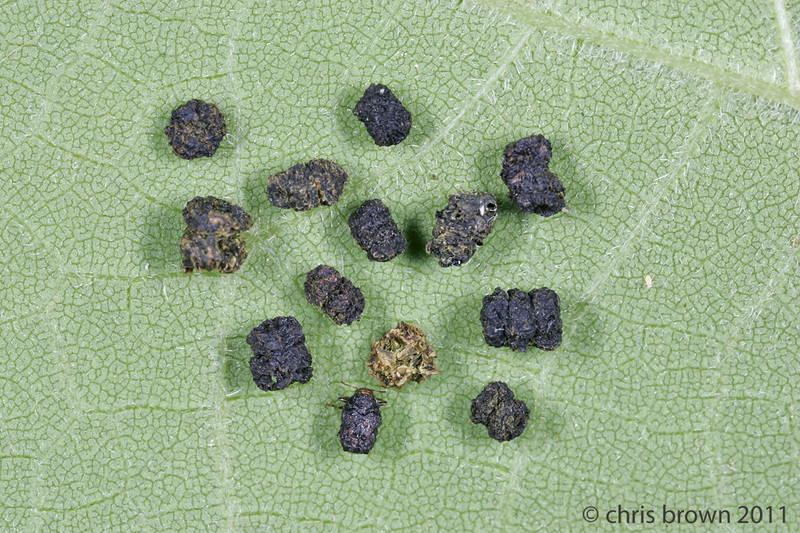 among caterpillar frass (aka caterpillar poop)? If you had trouble finding the beetle in the above image then check out the next image and you’ll see the beetle has “sprouted” a head, legs, and antennae. 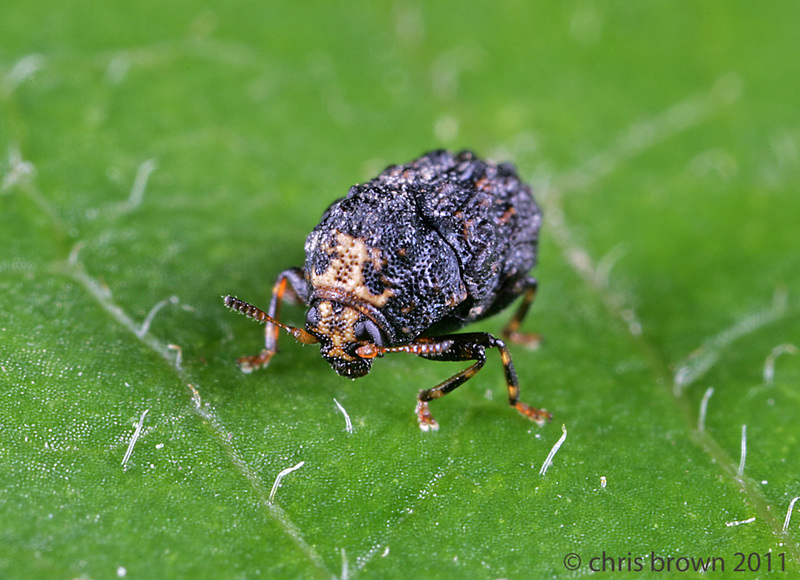 I don’t know what caught my eye the first time I encountered a warty leaf beetle on the foliage of a small shingle oak while exploring a woodland edge in Perry Co., MO. It probably helped that it was one of the larger species of the genus Neochlamisus but it still only measured about 3-4 mm. One thing I do remember about the encounter, though, is that there was something about it that made me do a double take. My first thought was exactly what the beetle might have hoped, that it was caterpillar frass. But this frass had legs (Figs. 3 and 4)! I was at first incredulous but soon became enthralled as I beheld something that I had never noted while flipping through field guides. 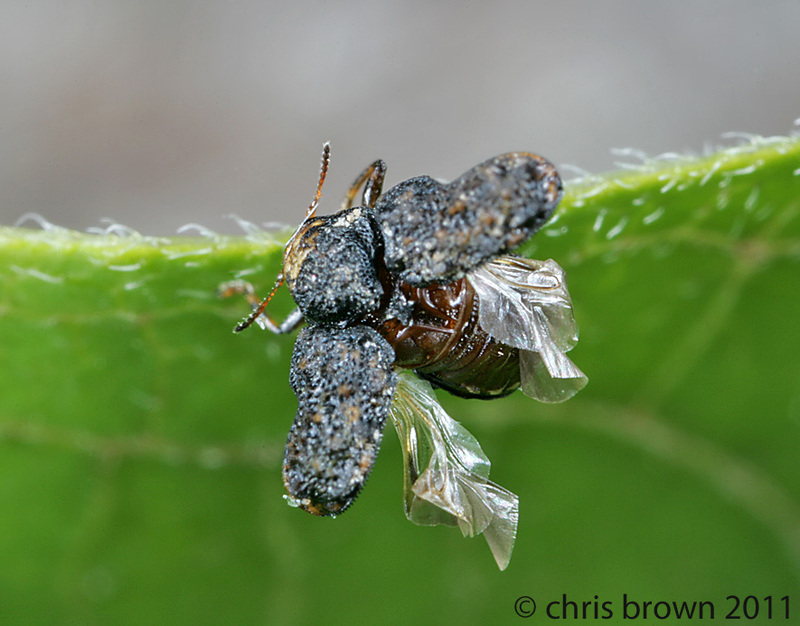 I had once again stumbled across something that I would never have imagined—a beetle that mimics caterpillar poop! The beetles in the tribe Chlamasini were apparently not at the table the day decisions were made on what model they would mimic. These guys at best mimic small bits of debris but are dead ringers for the frass of lepidopteran larvae (i.e., caterpillars). Then as if to add insult to injury, we dubbed the tribe the warty leaf beetles! The Chlamasini may humbly mimic excreta but what they lack in a flashy model they make up for with absolutely superb mimicry. 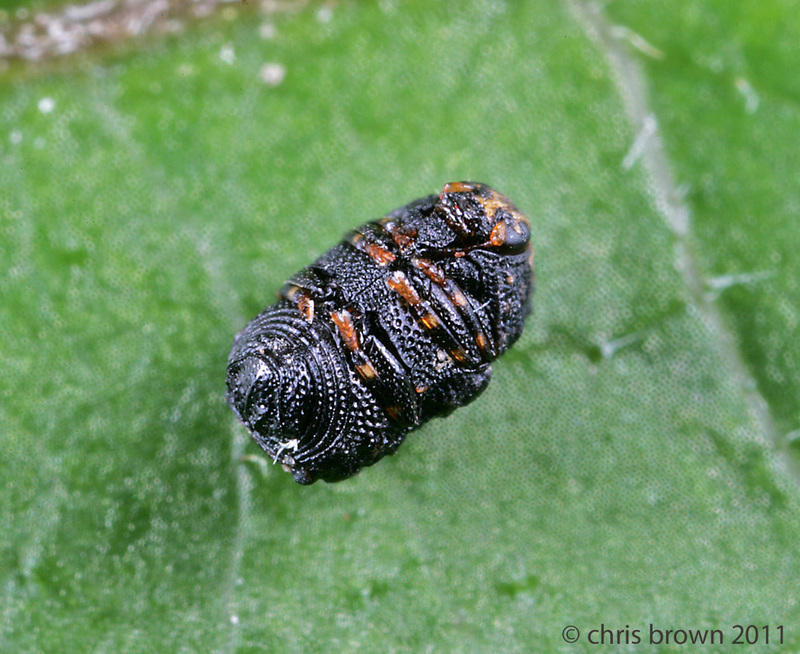 The Chlamasini are remarkably similar to the frass of lepidopteran larvae in size, shape, texture, and color but the aspect that really completes the mimicry is that, upon disturbance, the head is retracted and the legs and antennae are neatly folded into precisely matched grooves leaving no indication that this was once a beetle (Figs. 5 and 6). 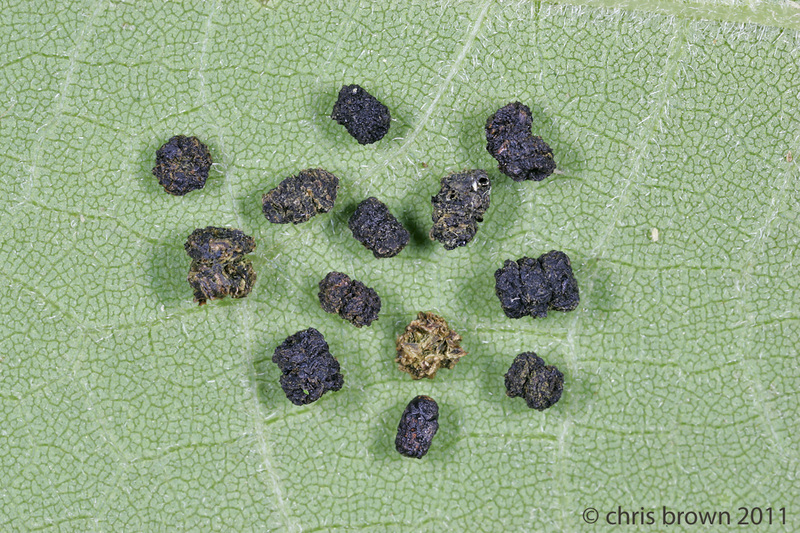 Even the finer details of coloration were not overlooked as some warty leaf beetle species are variably colored, including an almost metallic sheen in some places that closely resembles the coloration of some caterpillar frass. In fact the mimicry of warty leaf beetles is so convincing that I recently dropped a piece of suspect frass in a vial in hopes that it might sprout legs and represent a new species of warty leaf beetle for me. If the disturbance is sufficient to cause the beetle to completely retract these appendages, they will likely roll off the leaf and fall out of harms way. 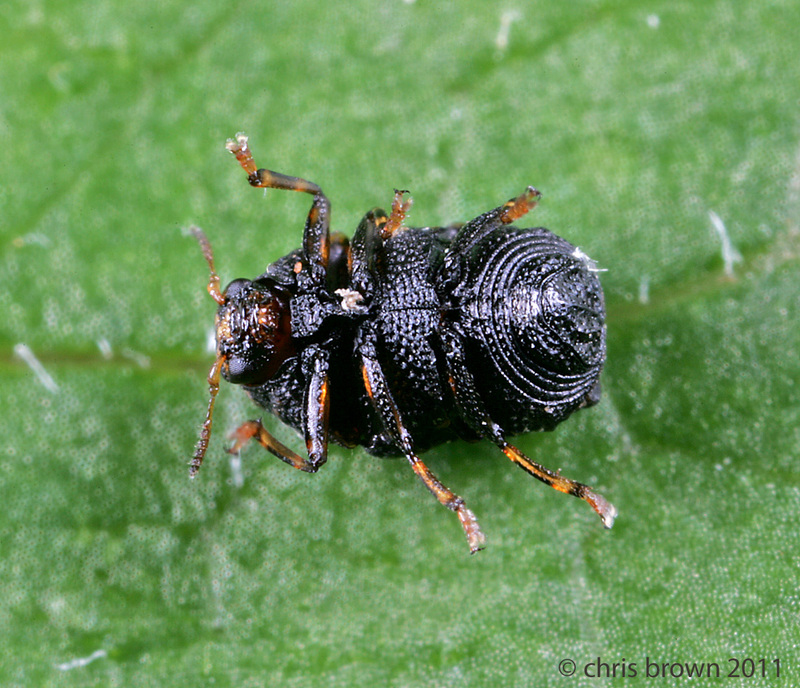 Though these beetles can be relatively common, occurring even in my suburban St. Louis yard, the small size [Exema is only 2-3 mm (Figs. 7 and 8) while Neochlamisus is slightly larger at 3-4 mm] and resemblance to something unremarkable ensures that these beetles often times go unnoticed. When I have happened to notice these beetles I found Neochlamisus associated with shingle oak, Quercus imbricaria, and Exema associated with Asteraceae, including gray-headed coneflower, Ratibida pinnata, and sweet coneflower, Rudbeckia subtomentosa. The Chlamasini are in the subfamily Cryptocephalinae within the leaf beetle family (Chrysomelidae). The Chlamisini can be found worldwide but are most diverse in the Neotropics. We have 6 genera in North America, two of which are shown here. Interestingly, the excreta theme doesn’t stop at frass-mimicry. 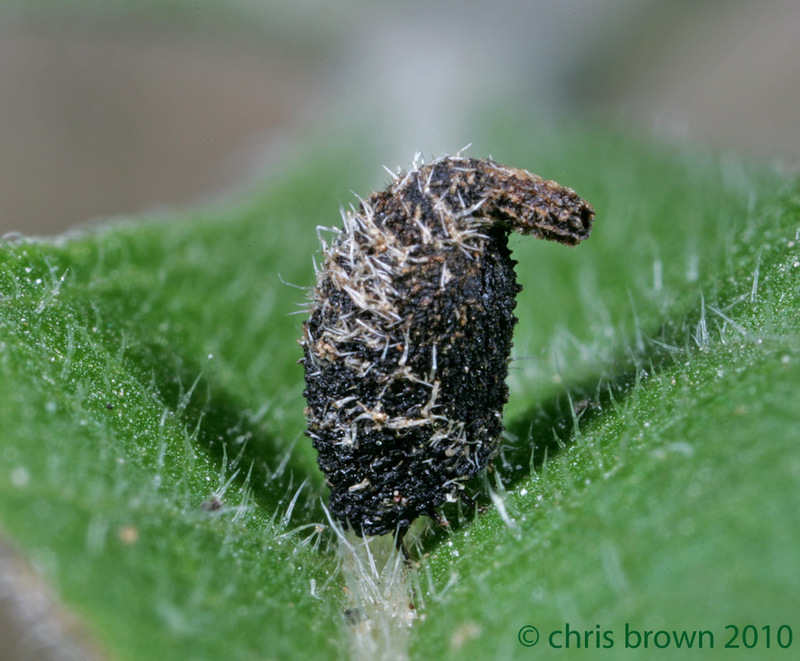 Like other members of Crytocephalinae, warty leaf beetle larvae are “case-bearing”; that is they are housed in a case which in this instance is made out of… you guessed it, their own feces (Fig. 9). You would think that most moms would frown on such a practices but mothers in the Cryptocephalinae actually instigate the practice when they equip each egg laid with a cap of feces that serves as starting material for the case and likely also serves to dissuade would be predators. My experiences with Neoclamisus seven years ago captures perfectly why I am so drawn to explore for insects— there is always something new to find and every once in a while something comes out of the wood work that is beyond what I could have imagined. Lourdes Chamorro-Lacayo, M. & A. Konstantinov. 2009. Synopsis of warty leaf beetle genera of the world (Coleoptera, Chrysomelidae, Cryptocephalinae, Chlamisini). ZooKeys 8:63–88. 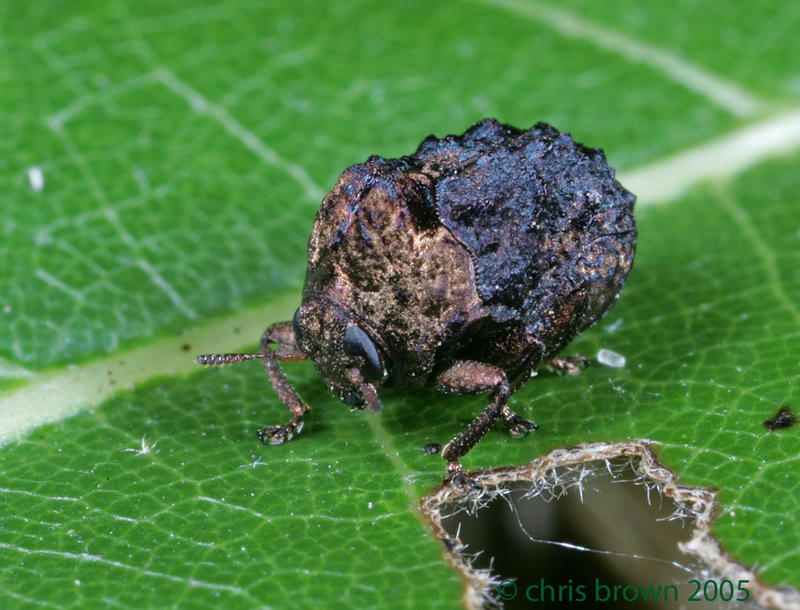 This entry was posted in Chrysomelidae, Coleoptera and tagged beetles, entomology, insects, mimicry, Missouri, nature, predator avoidance, warty leaf beetle. Bookmark the permalink. What a great discovery! And a good reminder that I should be paying more attention when I a out doing bug photography — things are not always what they seem. I agree, Adrian. No matter how much I think I know what to expect I always find something that I didn’t anticipate. Karren, J. 1966. A revision of the genus Exema of America north of Mexico (Chrysomelidae, Coleoptera). University of Kansas Science Bulletin 46: 647–695. Hi Ben. Thanks for the reference. I’ve also been surprised at how common they can be but I still have a tough time passing them up as a photo op. Ahah! Maybe now I can identify the one on Heliopsis I took a few pictures of three summers ago. Hi, James. This was years ago but I remember you finding one of these guys in your shoe. Awesome first post, Chris! Looking forward to seeing more from you. I’m wondering about that bent apex to the larval case and whether it serves a purpose or is an ‘accident’ of selection. Thanks, Ted. My mind is busy with ideas for new posts– now if we could just get the kids healthy maybe I could start working on them. That’s a good question about the bend in the apex– I don’t remember seeing any specific mention of it. Excellent–no way I could see the beetle in the first photo. Thanks, Patrick. Glad to hear it. It was my hope that it would at least require a close look but after setting the shot myself I was no longer sure how convincing it was. I DO enjoy BitB, and am soaking up all this Brownian Knowledge. Hope, however, it doesn’t mean we’ve seen the last of Ted. If you’re taking over all the heavy lifting, maybe he can come down to the Ozarks and swill beer with me, and identify these 18 vials of beetles from 2011 trapping, since I’m such a HORRIBLE beetlologist. Hi George. Thanks. As you can see you haven’t heard the last of Ted MacRae and I’m hardly up to the task of the heavy lifting of BitB. I have to agree that there are few people that can tear through beetle specimens like Ted. I know, I’m still floored by how good they are– those grooves where the appendages fit are so perfect. Right, the symmetry helps. I’m glad to hear that you think the images could be a good teaching tool. That is what I often times have in mind as consider how to photograph a subject, i.e., what kind of story can a picture or series of pictures tell. Great post, and excelent pictures as always! I´m glad to see that you still find time to enjoy the pleasures of life! Hi Ignacio. Thanks. Right, I’m always looking for an opportunity to get out and explore though I have had to content myself with agricultural fields more often than not these days. I hope that you are able to do the same– I know things have been super busy down there this season.